Keri's Kreativity: June Kraftin Kimmie Sneak Peeks - Day One! June Krafty Peeks...Day One at Kraftin' Kimmie Stamps! Sweet as can BEE! Welcome, welcome, welcome! Today we are kickin' off our JUNE Krafty Peeks at Kraftin' Kimmie Stamps! We've got a super sweet stamp set to share with you today! 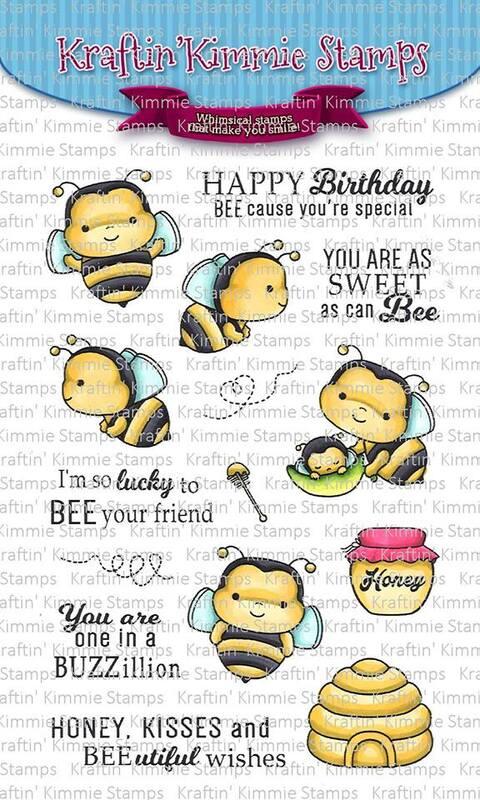 This BEE-utiful set was included in our Summer Krafty Kit along with TWO BRAND NEW Krafty Kolours Hybrid Inks!!! The set comes with SEVEN main images, some cute accessory stamps and FIVE fabby sentiment stamps for a total of FIFTEEN stamps in the set! The gorgeous new Krafty Kolours Hybrid Inks we are introducing this month are YUMMY YELLOW and MARVELLOUS MOCHA!!! You can get them in large ink pads, mini cubes and also refills!! They go perfectly with this release!! Check out this BUZZ-worthy set in action as you hop around the Krafty blogs today! You'll see the list of Krafty design team members PLUS special Krafty Guests below and be sure to leave some love at each stop because one lucky commenter is going to WIN a gift voucher to the krafty shop! Plus we're doing a GIVEAWAY of the ENTIRE release on the Krafty Friends facebook page! You'll get to see all the incredible creations for June as we share them each day this week! Be sure to join us at the LIVE Online Release Party on Saturday afternoon at 1pm EST! We'll be checking out all FOUR new clear stamp sets, sharing fabulous creations, giving away prizes and having tons of krafty fun! Happy hoppin' and we'll see you back here tomorrow for more amazing new stamp sets! I colored the black with my Copics W9, W7 and W5. I then took the Yummy Yellow and added some water on my glass mat and then water-colored the bees. I added more water to lighten the wash for the face and wings. I also added a slider so the bee could buzz on over to the hive. Love this card and a fabulous stamp set. Fabulous card! I love the floral patterned background! Beeutiful!! Love this stamp set! What a fun card! Love how you turned it into a slider card. Great colouring on your bees too! Oh my gosh that is so so cute! Love it! Adorable slider card! I love the papers,too. I love the bee slider card! So cute the bee can fly across the card. Sweet card! Love the bees! Love that the cute little bee can buzz around the front of the card! I like the slider idea, super cute!